The basic principle is the same today as it was a hundred years ago. For the production of fine spirits, carefully selected fruits are processed from optimal ripeness to mash. The natural fructose is converted by the yeast into alcohol, which takes about 2-3 weeks in a refrigerated fermentation. 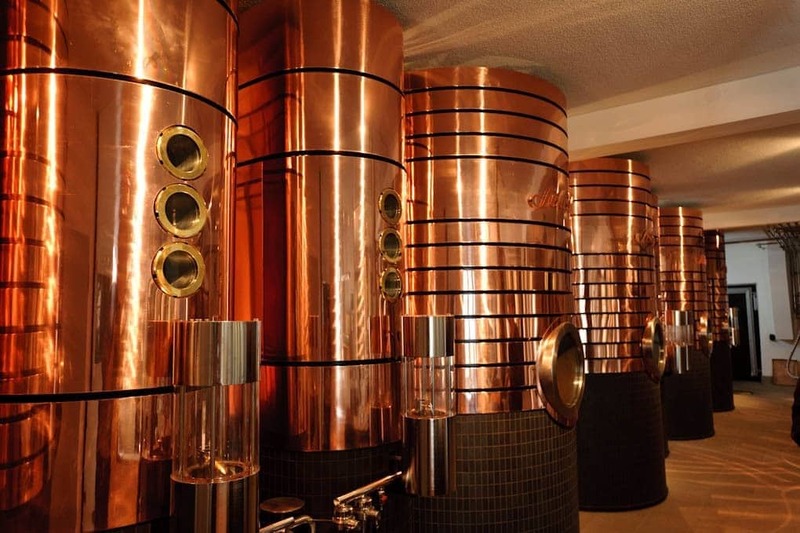 Subsequently, the fruit mash is heated in the boiler until the alcohol evaporates at 79 ° C. The alcohol vapor passes through the booster columns into the cooler, where it condenses again and is finally available as a finished distillate. The whole thing happens in copper kettles, then and now. Because copper is not only an ideal heat conductor, it can be processed well and provides the necessary reactions in the alcohol vapor. In the case of a water or fire, sugar-rich fruits are processed into mash and distilled twice in the distillation vessel after the fermentation has been completed. First as raw and in the second run as Feinbrand. If these are the pome fruit or quince, the finished distillate is referred to as a brand, while the term water is used for stonefruit such as cherries. A spirit, on the other hand, comes from low-sugar fruits like raspberries. These are, because they do not produce enough alcohol when fermented in a profitable amount, inserted in alcohol, which is called maceration. Over time, the fruits give off their aroma to the alcohol, and the macerate is then simply distilled in the boiler. To make liqueurs, the individual ingredients are mixed together in the right amounts and proportions, but above all in the right order, as with a cocktail recipe. Although the laws of physics and the basic craft of the art of burning have hardly changed in recent decades, this does not apply to distilleries. At Scheibel, the difference from earlier to today in the form of two different firing systems is not only visible but also palatable. 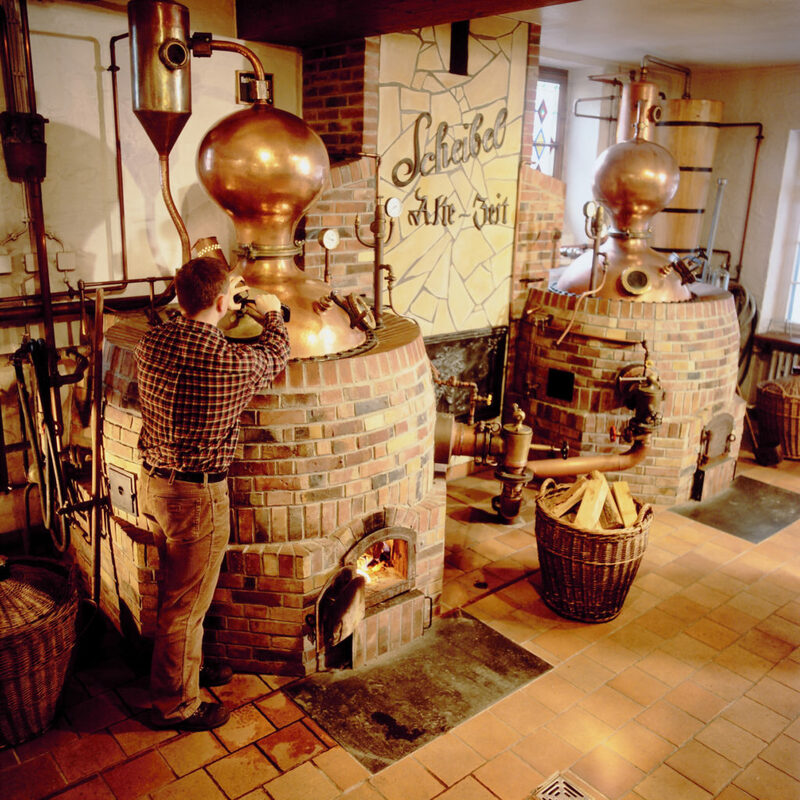 In the plant ,Old times' The fires are distilled in small copper pot stills, which are heated with wood fire. The result of this combustion process are characteristic and unique distillates with a particularly pronounced aroma. In the distillery ,New time' On the other hand, state-of-the-art fuel boilers are operated via touchscreens and heated with steam. The mash is distilled over gold and many processes are already fully automatic. The firing process produces particularly filigree, mild and multi-faceted products.